Inequalities between men and women isn’t anything new in the workforce. Issues can range from being fired from a job due to pregnancy or being paid less than a man. 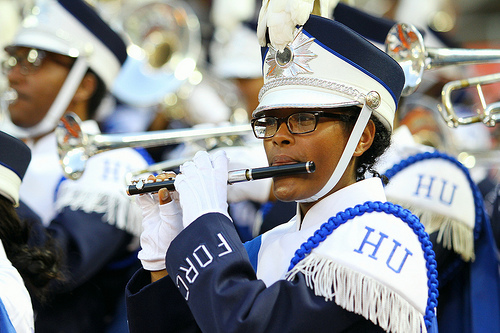 But, the Force, Hampton University’s marching band that brings the excitement to the football and basketball games each year has taken steps forward against gender inequality. Everyone knows about The Force. They are what drives the school spirit and are key in making Hampton distinct from other schools in the Hampton Roads area. They play the National Anthem as a way to show respect for our country, and they play the “Fight Song” to encourage the team to do better. Along with the band, there is Ebony Fire, the dancing group that flaunts their style in the stands as the crowd tries to follow them in suit. The Force and Ebony Fire stay in unison throughout their performances. What makes it better is that it is not just the guys who know how to show their instrumental talent. The ladies on the Force can play just as well. The treatment of the female members on Hampton’s marching band is the question. But, according to most of the band members, male and female, it turns out that the band treats their female members just as well as they treat the males. “I know that women are more likely to play woodwind instruments which means you will have less scholarship money compared to the men who dominate brass sections,” said Kaia Amoah, junior biology major from Cincinnati, Ohio. However, she also feels that as a woman in the band she is for the most part being treated fairly. “I think there is no room to really treat women any type of way because we kind of dominate the band. We have a female drum major.” Any band that lets a female lead the band could not be thought of as underestimating females. The Force is giving women a chance to shine as well as advance their music ability. In addition, Chris Watson, a Finance major from Broadview, Illinois shares his perspective on the issue of whether or not there is inequalities within the band. He believes that girls are getting just as many opportunities to shine in the band as the men, and has witnessed girls having just as good of music and physical ability. The women on The Force add more diversity to the mix. They are able to contribute more instruments. For example, the clarinet and flute tend to be played more by females. Whereas the tuba, drums, and trumpets tend to be played more by men. The Force should continue to let their female members strive to be the best musicians they can be, yet encourage them to play more brass instruments as well. Either way, the women are able to perform up to the standard of excellence.